IEBC face crisis after 4 commissioners defend Chiloba – Kenyatta University TV (KUTV). All Rights Reserved. IEBC is facing a crisis after four commissioners rejected changes by Chairman Wafula Chebukati to “clean up” the commission ahead of next month’s presidential poll rerun. Chebukati has called a plenary meeting this morning to discuss emerging issues and plans for the October 17 polls ordered by the Supreme Court. Before making the changes on Tuesday, Chebukati consulted extensively with staff members and other election experts. On Monday he tried without success to get the six commissioners to accept his plan. Vice chair Consolata Nkatha, commissioners Abdi Guliye, Paul Kurgat and Molu Boya reportedly objected to the “clean up” plans, which involved dismissal, and defended CEO Ezra Chiloba and the secretariat. Chebukati was supported by commissioners Roseline Akombe and Margaret Wanjala. Yesterday President Uhuru Kenyatta’s Jubilee party rejected the changes and NASA insisted the personnel changes did not go far enough. “Given the fact that acts of commission or omission that rendered the elections null and void originated from the IEBC staff, we hereby register our strong objection to the deployment of the above to be in a position to run the process,” Jubilee Secretary General Raphael Tuju said. The Opposition NASA, which has been pushing for the dismissal of top electoral chiefs, including CEO Chiloba, dismissed Chebukati’s changes as inconsequential. “Chebukati should not think people are fools. You appoint people to a project and don’t tell us the status of Chiloba and others who messed up the elections,” ODM Director of Elections Junet Mohamed said. Earlier on Tuesday, four of the seven commissioners resisted a radical purge which they termed irregular and illegal. “On what grounds are we to dismiss the officers?” one commissioner reportedly asked the chairman. Other commissioners insisted they should await the Supreme Court’s detailed judgment of what went wrong in the August 8 vote, tallying and transmission. 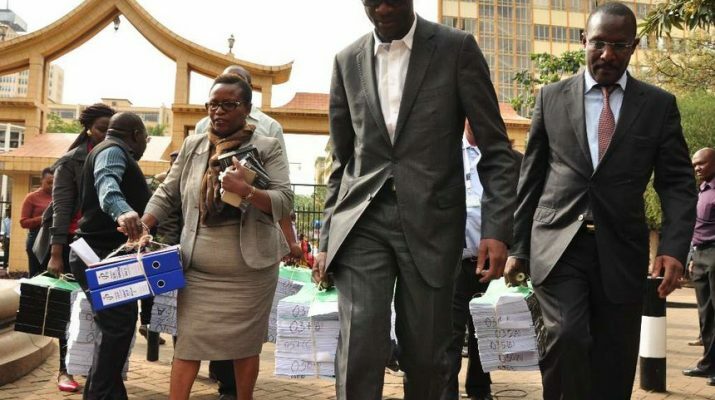 The four commissioners shot down Chebukati’s proposal to remove Chiloba, deputy CEO Betty Nyabuto and Director of Voter Registration Immaculate Kassait. Others are Director Legal Services Praxedes Tororey and ICT Director James Muhati. The vehement resistance denied Chebukati the majority necessary to adopt his far-reaching changes, forcing him to devise a new strategy. After the standoff at the meeting on Tuesday afternoon at Ole Sereni Hotel, Chebukati and Akombe retreated and emerged with a strategy on the rerun. This involved sidelining the embattled staff, initially to be sacked, and bringing on board a parallel team of county coordinators to replace them. Chebukati, a lawyer, quoted the law, which he said allowed him to realign election officials. “As the National Returning Officer, I wish to assure all Kenyans of my commitment to ensure this fresh presidential election is done in accordance with the Constitution, the relevant laws and that it reflects the sovereign will of the Kenyan people,” Chebukati said in media statement on Tuesday. In a manouever to sidestep Chiloba, Chebukati named one of the deputy CEOs Marjan Hussein, as project coordinator of the new elections. This puts Hussein directly in charge of all electoral processes, including staff supervision, for three months. Chebukati also named Kisii County Election Coordinator Sidney Namulungu as head of operations, a critical role previously under Deputy CEO Betty Nyabuto. Mombasa County Coordinator Nancy Kariuki was elevated to head of logistics, taking over from director of Elections and Voter Rgistration Immaculate Kassait. Kitui County Returning Officer Albert Gogo takes over the critical ICT docket from James Muhati whose tenure has been plagued by controversies. Chebukati said the new ICT boss will be directly answerable to him, in a change of tack after claims the election transmission system was hacked and results changed. Silas Rotich was moved from Nakuru county to take charge of the National Tallying Centre, while Salome Oyugi was named new Legal Services director. But Jubilee singled out Marjan and eight other staff whom they claimed to be partisan said must not be in charge of the poll. These include Oyugi, Head of Investigations Chrispine Owiye and Manager of Corporate Servoces Tabitha Mutemi. Others are Joyce Ekuam, Limus Onyango, Caroline Manyange, Joseph Ayatta and Deciman Mmayi. Raila Odinga’s NASA team had also named seven officials whom they claimed bungled the General Election. Yesterday, Raila and his co-principals were to meet the IEBC chiefs and the staffing issue was expected to feature prominently. NASA has issued a raft of demands before taking part in the new election and has threatened a boycott. It demands a full audit of the technology deployed in the election, review of the poll register and polling stations. The opposition leader, who successfully challenged Uhuru’s reelection, also wants the IEBC to set up a technical monitoring committee with representatives from the main parties to provide oversight for electoral preparations. On Friday last week, the Supreme Court declared Uhuru’s reelection null and void, citing “irregularities and illegalities”. It ordered a rerun. This was the first time an African court overturned the election of a sitting President.